(SPOT.ph) There’s no denying that local brands are having a moment. If you’re always on the lookout for fashion and lifestyle names that are proudly homegrown, it’s time to head over to Shangri-La Plaza to check out these latest shopping hubs: The Park, which carries statement earrings, leather goods and more; and Styled, a fashion pop-up that features casual and formal wear, among other cool finds. If chic handbags and statement earrings are your weakness, then Cathy’s Bags has the answer. They have colorful rattan cross body bags and vibrant baubles that you can have fun matching with outfits. Because it’s practically summer all-year round, it’s good to have a go-to shirt that won’t dampen your personality. Pasadya_Manila’s tops are just what you need for lazy days about town. Give your gadgets a stylish home with a purchase from The School of Satchel. Your laptop and tablet will keep well inside one of these cool leather items. The weaving tradition of Mindanao earns its much-deserved spotlight in the form of the most stylish tops, skirts, and scarves from Kaayo. Can’t get enough of fringe? These vibrant pieces from Lluna the Brand will have you gladly turning in your classic stud earrings. When the sun is calling you 24/7, you’ll never get tired of looking at one-of-a-kind pieces that Soak Swimwear has in their collection. You’ll love browsing the selection of room sprays and reed diffusers at ASB House of Scents. It’s the perfect gift idea, too! Comfort always wins when it comes to shoes, and these pretty options from Sewn Sandals won’t disappoint. Another new space that’s not to be missed is Styled, which launched on July 30. The hub carries a selection of local brands that feature casual wear to evening wear, among other lifestyle options. The space is the product of a collaboration between TV personality Christine Babao and celebrity stylist Jason Alcoriza. 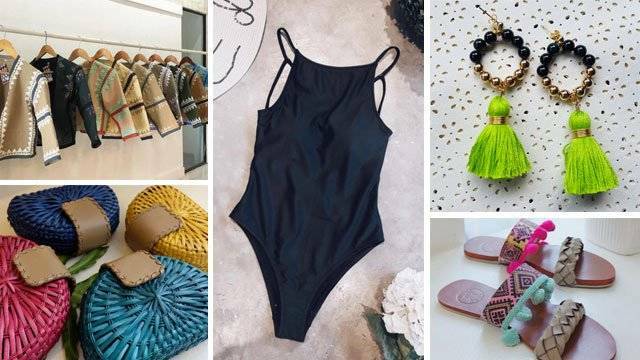 You can shop for a fun night out with friends at Bennita Clothing and Fashion Hub by Dayan; or even find formal wear options by local designers like Andrea Tetangco, Jamie Go, and Ronald Enrico. The Park is at 4/F Shangri-La Plaza Mall East Wing, Mandaluyong City. Styled is at Mid-Level 2/3, East Wing, Mandaluyong City. For more information, call 370-2597 or 98, log on to Shangri-La Plaza’s Facebook page, or follow them on Instagram. This article was created by Summit Storylabs in partnership with Shangri-La Plaza.